Since his appointment in December 2016, Uzbek President Shavkat Mirziyoyev has focused on rekindling regional ties in Central Asia, which had long been neglected by his predecessor Islam Karimov. Mirziyoyev’s first official trip as president was to Turkmenistan, the most isolated of the five Central Asian republics. Most notably, Uzbekistan has also dropped its longstanding opposition to hydroelectric projects in Tajikistan and Kyrgyzstan – Karimov once threatened Tajikistan with war over the its proposed construction of the Rogun dam. For the most part, Uzbekistan’s neighbors have responded positively to the president’s overtures. Kazakh leader Nursultan Nazarbayev recently met Mirziyoyev in the ancient Uzbek city of Samarkand to celebrate Nowruz, the Persian New Year, while Kazakhstan has also declared 2018 to be the “Year of Uzbekistan.” Likewise, Tajik President Emomali Rahmon – who often butted heads with Karimov – has ambitiously announced that bilateral trade between Tajikistan and Uzbekistan would soon reach $1 billion; the total figure in 2017 was $126 million. These are interesting developments for a region that has never been very closely integrated, despite its shared history under the Soviet Union. Kazakhstan, for instance, has focused its diplomatic efforts since independence on international – rather than regional – engagement, assuming chairmanship of the OSCE in 2010 and organizing the 2017 World Expo in Astana. Even today, there is no single body that defines Central Asia, unlike the European Union or even ASEAN. The Shanghai Cooperation Organization and the Commonwealth of Independent States are both dominated by external powers, while Russia’s pressure on Kyrgyzstan and Tajikistan to join the Eurasian Economic Union shows how little say the Central Asian states have in these organizations. To add to this, regional frameworks such as the Interstate Commission for Water Coordination have failed to mitigate bilateral disputes, let alone foster a greater sense of unity. This seems to be changing under Mirziyoyev. 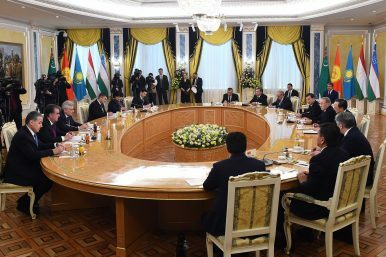 During his address at the United Nations General Assembly last year, the president announced that “Uzbekistan considers the region of Central Asia to be as the main priority of its foreign policy.” Already, we are seeing greater avenues for multilateral cooperation in Central Asia – the first regional summit in almost a decade took place in March, with four of the five leaders in attendance. No doubt, numerous challenges remain with regard to the development of regionalism in Central Asia. Opium continues to flow through the region from Afghanistan, creating health, security, and economic risks, while it remains to be seen whether Mirziyoyev’s enthusiasm for hydroelectric projects in upstream Kyrgyzstan and Tajikistan will last, especially if downstream water flows to Uzbekistan start drying up during the summer months. Nonetheless, stronger regional cooperation would prove a boon to complex cross-border projects like the Turkmenistan-China Gas Pipeline, which passes through all five Central Asian states via four different lines before reaching Xinjiang in China. Discussions are also underway on the China-Kyrgyzstan-Uzbekistan railway, which has been in the works since 2002 but has not been implemented because of disagreements over the proposed route. Projects like these require unprecedented levels of cooperation and communication, but would provide considerable benefit to local communities – the China-Kyrgyzstan-Uzbekistan railway would create new jobs in cities like Osh, by connecting them to new export markets. Central Asia has long been neglected by governments and development agencies; as international capital finally starts to flow into the region via the Belt and Road Initiative, however, it is essential that the five leaders put aside their differences and continue this trend toward greater regionalism, in order to reap the maximum possible benefits from these projects. Yi Da Jeremy Ng is a recent graduate of Columbia University, and has worked at the Eurasia Foundation of Central Asia in Tajikistan as a Padma Desai fellow. He is currently an intern at the Asia Society Policy Institute, where he conducts research on topics such as China’s Belt and Road Initiative.